The major part of any online store is customers. For this reason, e-commerce sites nowadays, mostly focus on a specific mass so as to implement better marketing strategies to set a mark in the e-commerce industry. Having said this, we are aware that in today’s era, entertainment has become an essential part of man’s life. People look forward to visiting various events such as live shows, live concerts, music concerts, etc during there leisure hours. 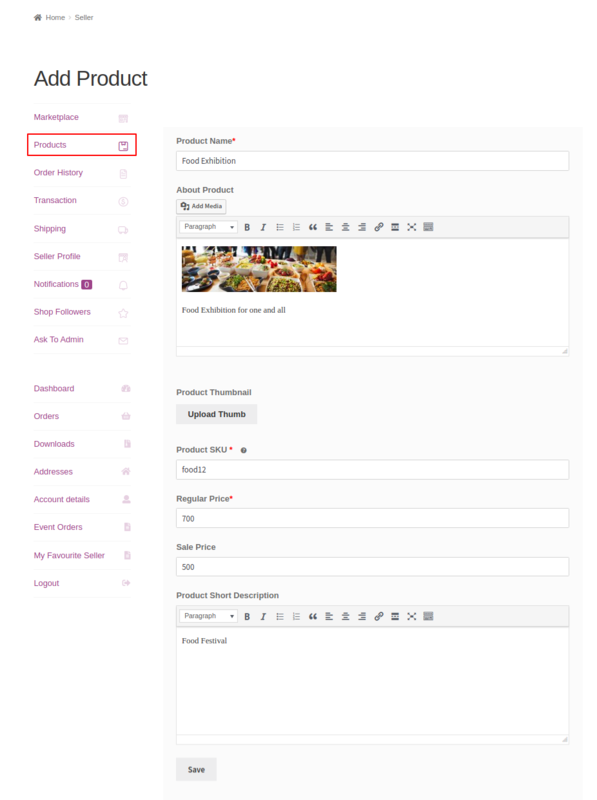 Marketplace Event Manager for WooCommerce extension comes with an interesting feature for admin and the sellers, as both can add event products for any type of events like live shows, music concerts etc. This extension also allows the customers to add the events to the Google Calenders. The customers can simply purchase event products like a normal purchase. This extension reduces the hassle of purchasing the tickets for an event in multiple tedious steps. This would keep customers intact to your site, thereby increasing the conversion rates. On clicking on the “Upload Plugin” option, below that you will see a button “Choose File” click on the button to browse for the zip file as per the snapshot below. To use this plugin, you must have API Project Credentials. Google API Project Credentials are required to configure this plugin. Please click here to create a new project with your Gmail account. 1. After opening the page under “Credentials”. Please click the “Create” button as shown in the image below. 2. Enter the name of the project you want to create. 3. Click “Create credentials” to choose the credential type. 4. Select “OAuth client ID” from the list. 5. Enter the Store URL and the redirect URL. 6. Copy credentials to enter into the configuration of the plugin. 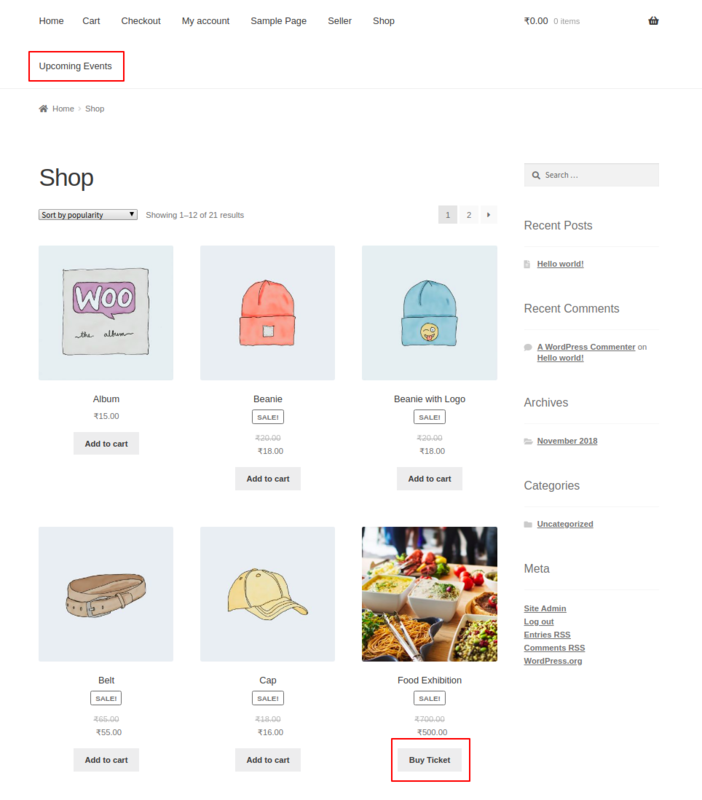 After successful installation, the admin can configure the Marketplace Event Manager plugin by navigating through “WooCommerce > Event Settings”. 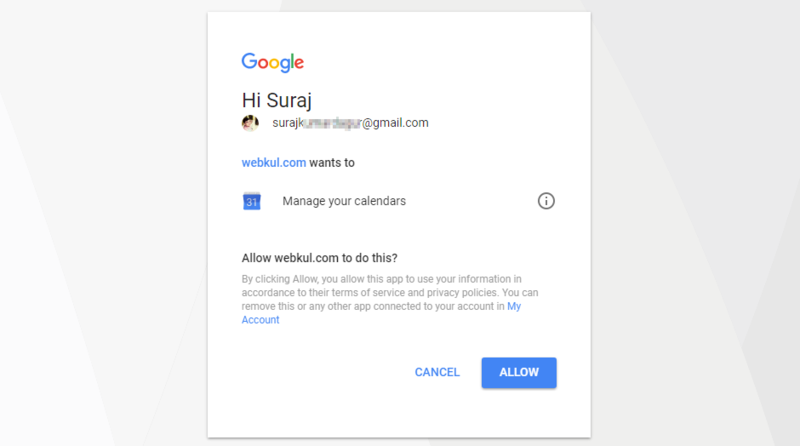 Here the admin will enter the Google API credentials to configure the Google Calendar Account. Timezone: Select timezone from the drop-down list. Id: Enter the client id retrieved from Google. Secret: Enter client secret retrieved from Google. Redirect URL: Enter redirect URL for the upcoming events of the website. After configuring the Marketplace Event Manager plugin, the admin can add a new event by adding a new product. The admin can click on Add New option under Products tab in the admin dashboard. On the Add New Product page, the admin can view the E Tickets option in the list given against “Product Data”. The admin will have to choose “E Tickets” against “Product Data” and tick the checkbox for the Virtual product option as shown in the image below. On clicking the “General” tab option, the admin can provide the ‘Regular Price’ as well as the ‘Sale Price’. For example, the admin has set the ‘Regular Price’ as 500 and Sale Price as ‘350’ in the image below. Under the “Inventory > Manage stock” the admin will have to tick the ‘Manage Stock’ to enable the management of stock at the product level. On clicking the”E Ticket”, the admin can configure the event details as shown in the image below. Enable terms: Tick ‘Enable terms’ in order to display the data of Event Term option in the frontend. Term: Enter the event term which will be displayed in the front end. Start time: The admin can add the start time of the event. End time: Set the end time of the event. Location: The admin can set the location of the event. The admin can also provide the custom options for the tickets as shown in the image below. On clicking the “Custom Options” tab, the admin can add custom options by clicking the ‘Add New Option’ tab. For example, the admin adds platinum, gold and silver custom options, and their price, stock, sort order. Similarly, the admin can also remove any custom option by clicking on the “Remove” tab. 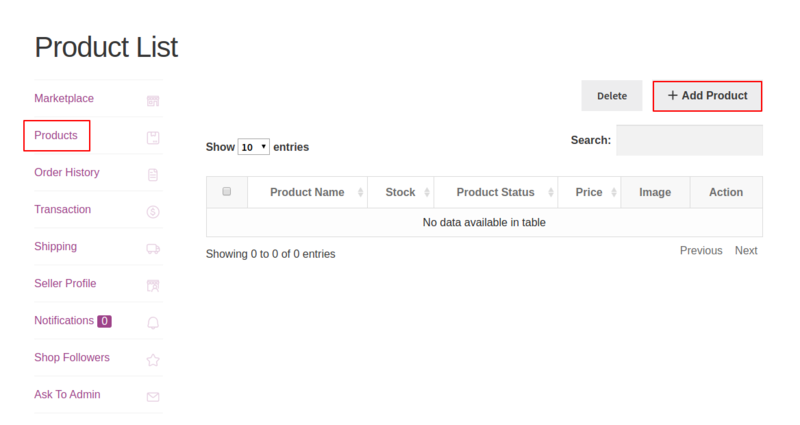 The seller can add a new product by navigating through Products > Add Product in the seller panel in the frontend as shown in the image below. When a seller clicks on the ‘Add Product’ tab, it redirects the user to the Add Product page. 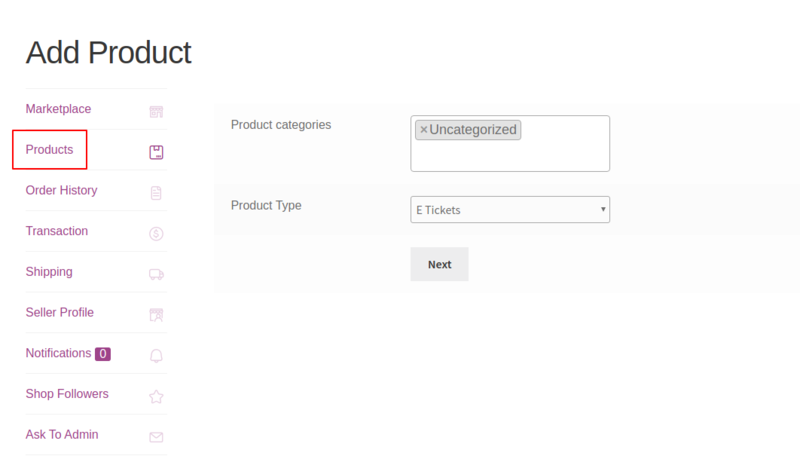 In the Add Product Page, the seller can choose a category/ categories against the “Product Categories” option and Choose Product Type as “E Tickets” as shown in the image. On clicking the ‘Next’ button, it redirects the seller to the product details page as shown in the image. The seller can add the details of the products such as Product Name, Product Image, Product SKU, Regular Price, Sale Price, and Product Short description. Once the seller fills in the details of the product, the seller can click on the ‘Save’ button to save the product details. 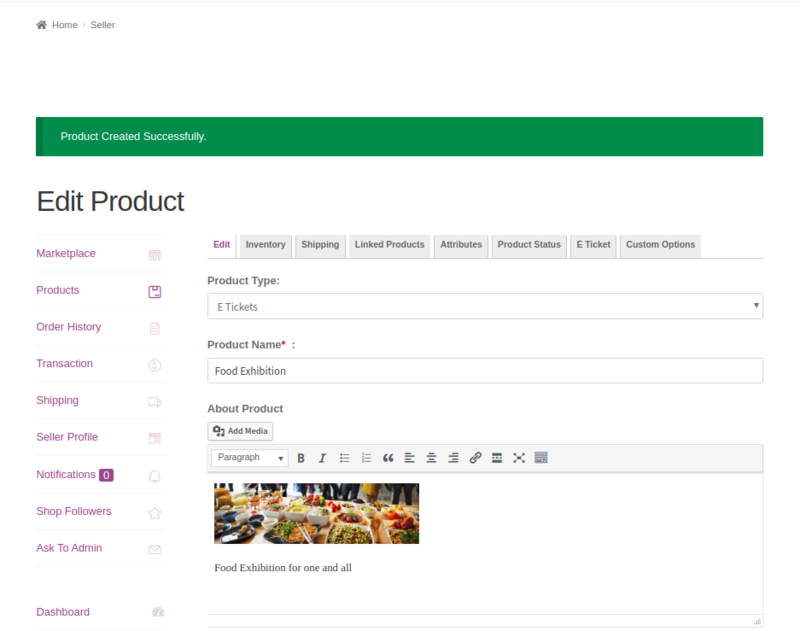 On saving the details of the product details, a message “Product Created Successfully” displays on top of the Page as shown in the image below. 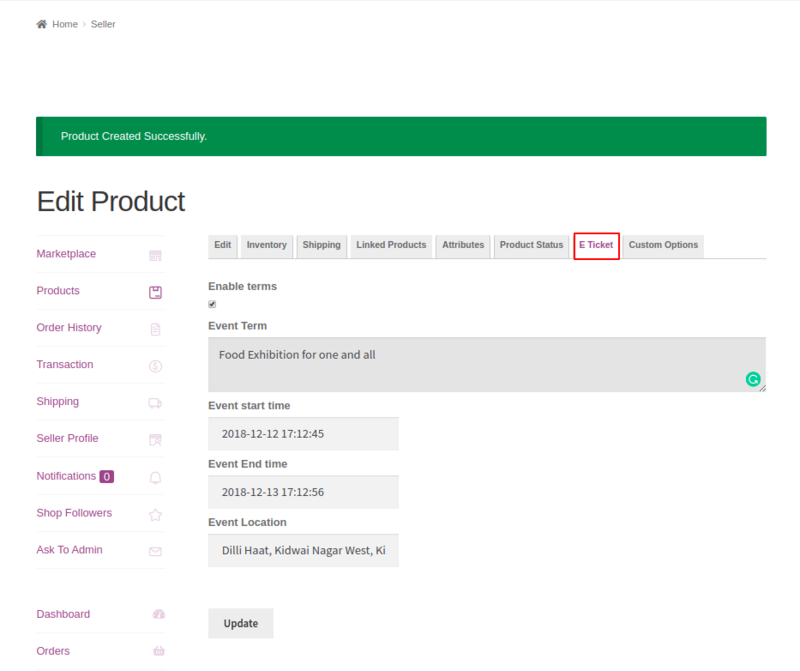 Once the seller creates the product and saves the product details, under “E Ticket”, in the Edit Product page, the seller can configure the Event details. Enable Terms: Tick the ‘Enable Terms’ to enable the Event Term option. Term: Add the details of the event which will display in the frontend. Start time: Mention the start time of the event. End time: Mention the end time of the event. Location: Mention the venue of the event. The seller can click on the ‘Update’ button to update the details. On configuring the event details under Custom Options, the seller can create custom options for the event tickets. The seller can click on the “Add New Option” tab and create the custom options. For instance, the seller creates platinum, gold, and silver custom options, so as to configure the Price, Stock and Sort Order accordingly, as shown in the image below. The customers can click on the “Upcoming Events” tab and view all the events that are going to occur in the location which the customer enters. 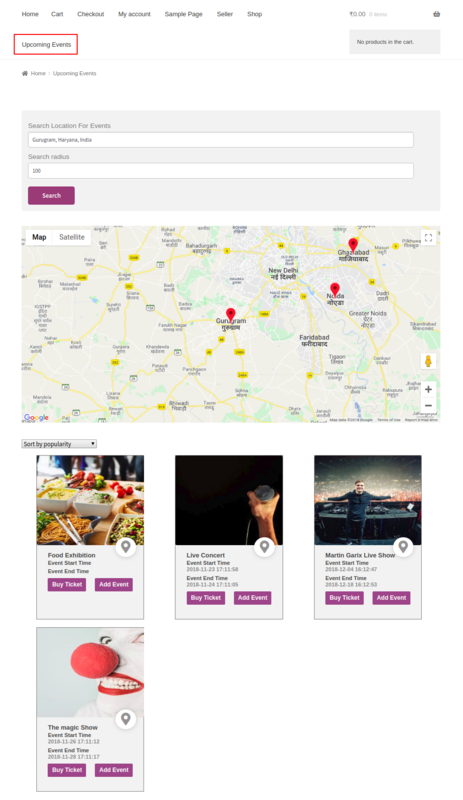 On clicking the “Upcoming Events” tab, the customer will have to enter a location to search for the event will be taking place in that area or within the radius which the customer provides in Google Map. 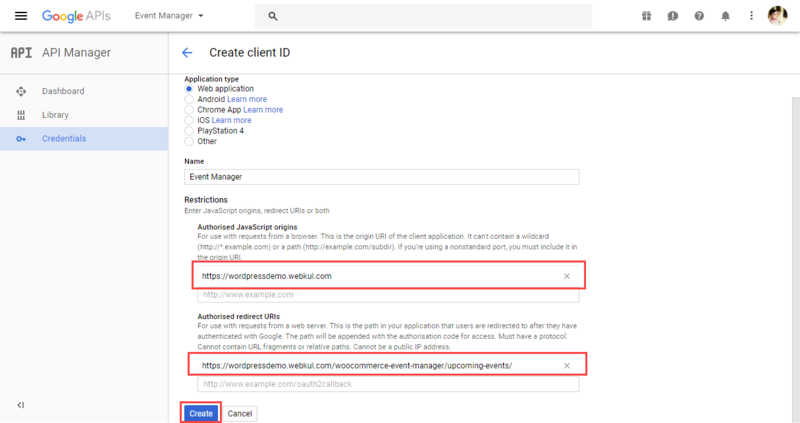 A customer can add the event to the Google Calander by clicking the “Add Event”. The user clicks on the “Buy Ticket” button to buy tickets for the event. 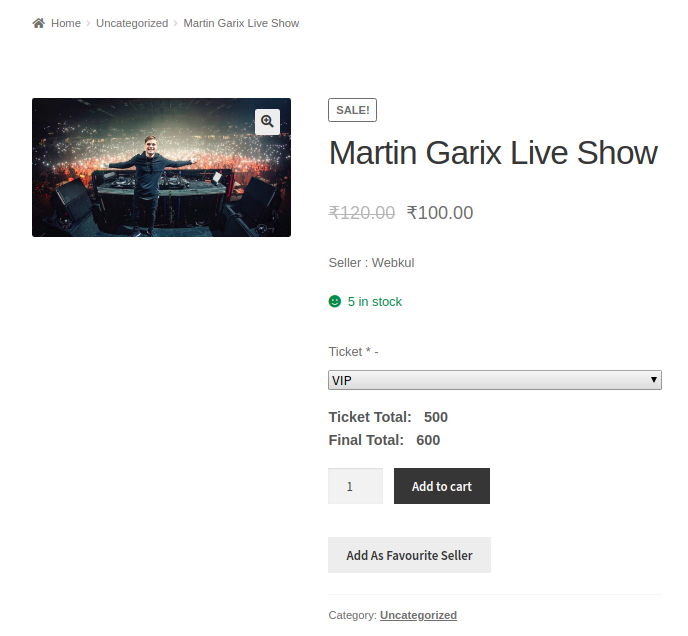 On clicking the “Buy Ticket” button, it redirects the customer to the event page. The customer can choose the options from the given list for the tickets and the relative price will display. The customer can add the product to cart proceed to check out and buy the tickets for the event.